It's been a somewhat productive week on the blog---I broke down and read a mermaid book, discussed The Mortal Instruments movie and got crazy when I posted my TTT on a Wednesday. I know. I'm such a rebel! It's been a tough week so I'm really looking forward to the long, holiday weekend. Do you all have any plans? Well, here are some awesome links to get the weekend started. Enjoy and have an awesome Labour day! Barnes & Noble pulls the plug on their buyback plan and this is what it means for their business. Check out the prequel to Cristin Terrill's highly anticipated book, All Our Yesterdays, online in these mini webisodes --- Part 1 , Part 2 & Part 3. There will be a J.D. 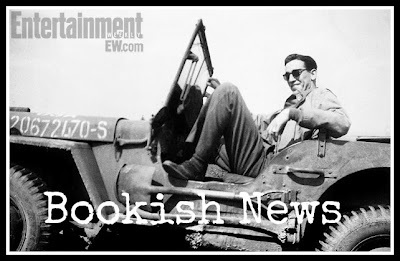 Salinger biography and 5 new books to be published posthumously. There's been a lot of buzz about Samantha Shannon's The Bone Season. You can check out an excerpt over a Tor and enter a giveaway from The Book Smugglers to find out if it lives up to the hype. Who should Dumbledore meet? Rowling answers this question. EW gives us our first sneak peak into Allegiant by Veronica Roth. Does the recent flop of The Mortal Instruments, mean the end of YA book-to-movie adaptations? Probably not and a lot of people aren't happy about it. Here's a look at how the rest of this year's summer movies ranked. First there was the teaser then the VMA's gave us the official Divergent movie trailer. Aren't you excited?! 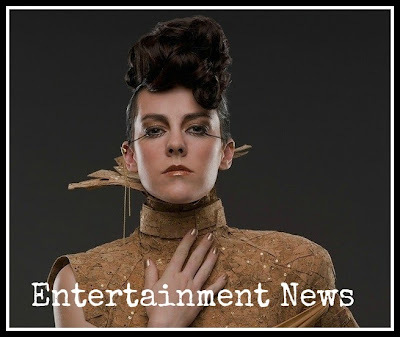 Capitol Couture is the new viral marketing campaign for Catching Fire and it is fierce! Even Covergirl got in on the action. Steve Carrell will play a schizophrenic murderer in the upcoming flick, Foxcatcher. Do you think he can pull off something so serious? Here are some fun facts about your favourite 90's movies. It was announced that Ben Affleck is the new Batman and I am not happy about it. Does anyone remember the travesty that was Dare Devil?! Haven't we learned from our past mistakes?! 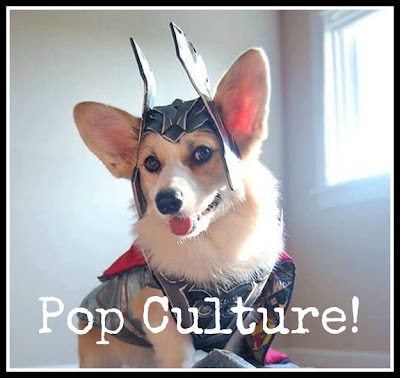 Meet the Mighty Thorgi, dog of Asgard. This is the most ingenious use of a scrunchie EVER! This Jurassic Park LEGO set needs to become a reality because I will totally buy it. How to know the difference between who vs whom plus 50 things every geek should know.The more you learn, the more you know! Finally, some crazy cartoon conspiracy theories to round out your weekend. I will be posting the Divergent trailer on Sunday because I am oh sooooo excited! That Allegiant tease is killing me. Oh and I have seen a lot of hype over that book The Bone Season lately so I went ahead and added it to my TBR pile. What about you? Only 2 more months to go until Allegiant is published! I've added The Bone Season to my TBR pile as well. I hear it's very well done and I'm always down for a good high fantasy series! Great TGIF post Nikki. I agree, why cast Affleck as the next Batman? For me, Michael Keeton was it. I loved him as Batman. Fun 90's films facts! I don't understand the Affleck thing, I really don't. I TOTALLY agree with you! Michael Keaton wasn't the best Bruce Wayne (I bestow that honour upon Val Kilmer) but Keaton's Batman was always my fav! I think Affleck is good with the serious stuff, but serious drama doesn't always equate to serious comic book stuff. I do have my doubts and am NOT pleased about this. What did you think about the Divergent trailer?